Breakfast, included in the 12$, on the roof of Flamingo is a thin piece of mango, a small banana, a small loaf of bread and eggs in a style of your request. Can’t complain for the price of the room, though the serving guy seemed pretty miserable and rebuffed all my efforts to wish him good morning or thank him for any of his efforts. After a shower, I head out on the streets of Stone Town, heading down into town a different route, this time taking me past the tip of Shangani, including the Zanzibar Serena Inn, supposedly the best hotel in town. Doesn’t look bad. Down at the waterfront, I pop into the Zanzibar Gallery shop to pick up some postcards, the first in a long time, as Mozambique and Botswana didn’t really have postcards available. Then to the two dive shops, Bahari and Zanzibar Dive Centre, to speak with them about what they’re doing and how the diving is. I prefer the ZDC, and book to dive with them tomorrow. Lunch I take at Radha Food House, a small Indian place opposite the NBC bank. I’m the only one in there as I tuck into a tasty thali with a vivid-green but nice pistachio yoghurt. It’s too hot for spicy food though, and it’s a real battle to stay cool as I pile on the chutneys! They have a detailed map of all of Stonetown on the wall, which makes interesting reading – I notice a “Rope soap and oil factory” marked out in the suburbs, along with a region described as “Old people's houses”, presumably the Bournemouth of the island. Also a “Clove distillery”. Furthermore, I could work out just how horribly lost I was the previous day – turns out I crossed Creek Street, which meant I ended up really far from the centre, and frankly I’m quite lucky I ever found my way back! Next I visit the Old Fort, which apparently was built by the Omanis to repel Portuguese attacks. It’s been used for a variety of purposes since, but now hosts a number of tat shops and a small café in front of the stone amphitheatre inside. I had the impression that little was being done to care for the structure, despite the “donations box” at the front entrance. Next door is Beit el-Sahel, a former Sultan’s palace, designed by a Scottish chap and a strange mix of architectural styles. Inside is the “House of Wonder” museum, which initially I thought would be very tedious, but it turned out extremely interesting in fact, and I’d strongly recommend anyone in Stonetown visits it. Entrance fee is 3,500s. The spacious interior hosts some (replica?) dhow ships, which I didn’t find so interesting, but also a series of information boards and smaller displays. The displays were generally quite dull too, but the information boards absolutely fascinating, discussing Zanzibar’s history and culture. For example Zanzibar was host to the shortest war in history when the Sultanate declared independence from Britain in 1896 after being made a protectorate a few years early. Clearly this was timed badly, as a British warship was in port, so 45 minutes later the war was over and the Sultan exiled to St. Helena and Seychelles. Of course now people pay for this privilege! So originally there was a creek dividing the area settled by Europeans from the rest of the island. This creek was used as a cordon sanitaire, and mud houses were constructed in Ng'ambo (meaning “the other side”) for locals, whereas this side of the creek the building were all of stone, hence Stonetown, for the European or Omani rulers. Today the creek has gone, but Creek Road runs roughly along where it used to be. Some time in the exhibition is given over to discussing the dhows, a term made popular by the British Navy, meaning a single hull wooden sail-boat, and their trade routes, stretching from the Mozambique Channel to China, but focussing on India, the Arab World and East Africa. 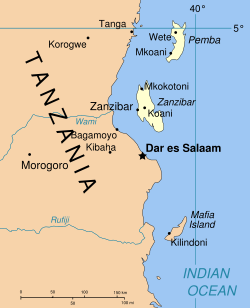 Swahili, the language used in Tanzania and Kenya, comes from an Arabic word “Sahel” meaning coast, for it was the language of the coast, not the interior, and there are overlaps with Eastern and Middle-Eastern languages. Zanzibar is thought to come from the Persian “Zangi-bar”, meaning “Coast of the Blacks”. Incidentally I should mention that the island I am on is Unguja, the largest of the archipelago. 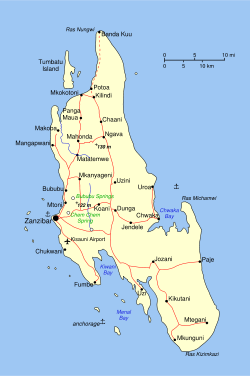 There are other islands – Pemba being the second-largest, about 50km away. 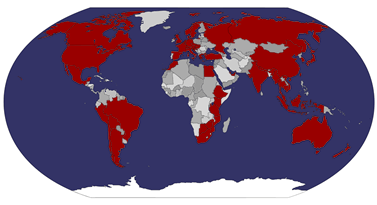 Zanzibar slightly confusingly refers to both the Archipelago, also the largest island, i.e. Unguja, and to Stonetown and surrounds itself, i.e. Zanzibar Town. Another board mentions Swahili women and their fashion. The Khanga is the colourful wrap women wear, and as for their hair styles, they have lots of names (translated), including “I am under your feet, grandmother”, “Dress the bed”, “Bunches of banana” and my favourite, “Evil eye of the second wife”! From the museum I go wandering in the small streets, cutting across to use the Barclays ATM (out of money), then back (I get lost). I stumble across an internet café which will let me plug in my laptop for less than double the price of using their computers, so I sit down and get comfy. It’s run by Felix and his wife, Indian locals who are very friendly. He gives me lots of advice, and confides that there is apparently a cholera outbreak here too, I should avoid sugar cane juice from street vendors – common sense if you ask me, but if there’s cholera I may also stop brushing my teeth with tap water! Part of the problem with navigating the old Stonetown alleys is that it all looks quite similar, and the streets are so narrow that one can never see any landmarks. So frequently I’ll find myself emerging on to a street or alley I recognise, but I won’t know which was along it to go, having long ago lost my bearings. There are a couple of signs about but most, believe it or not, have been painted over and not rewritten! Incidentally, I still haven’t quite worked out “Jambo Etiquette”. As far as I can gather, Jambo is the short form of their real greeting, which foreigners who don’t speak Swahili are not expected to master, hence easy Jambo. In response though, sometimes one is answered “Jambo”. Sometimes, they come back with “Mambo”. Sometimes, if they start the procedure, I reply to their Jambo with a Jambo, then they move on to a Mambo exchange! Whatever can it mean! I understand if a Mambo is dropped in, one should come back with “boh”? And I won’t even get on to Karibu (welcome) and other advanced forms of conversational exchange! Dinner I have at Amore Mio, where I had the tasty home-made Italian ice-cream earlier. It’s empty, so I take a table by myself at the back, overlooking the beach and water. Ship lights twinkle out in the bay. I have a salami pizza and a glass of wine. They don’t have beer. I wonder why wine is okay if beer is not? Lots of the restaurants here don’t have alcohol at all. This would be the usual imposition of beliefs on the rest of us. Anyway, the pizza is great, as they use proper thickly-cut salami. I douse it liberally in chilli oil of course, wouldn’t want to be cool at night after all! Over dinner I read a free touristy pamphlet I’ve picked up, which reminds me for the umpteenth time that this is a Muslim island, and I should respect this by wearing certain clothes and not drinking alcohol, which got me thinking about what we ask of tourists that come to the UK. If Arabic tourists turn up with four wives walking two metres behind them, do we remind them that this is a Christian (Atheist perhaps!) country, and would they mind respecting our culture by drinking beer, taking off their veils and not treating their women as second class citizens? Oh, no we don’t. Sometimes I think we’re just a bit too tolerant and respectful.